Most water main breaks occur during the cold winter months. This is especially true if we get little or no snow to insulate the ground. If you spot a water main break please call us immediately at (847) 746-4060. If after hours, report the main break to the Police department at (847) 872-8000. Although main breaks are fixed under pressure, those services connected to that main will experience a pressure loss as if the water was turned off. Fixing the main is a top priority and as time is of the essence we do not notify residence that they may be without water for a while. We regret any inconvenience this causes. If no problems exist the water is usually back to normal pressure within the hour. Download Information HERE from the Lake County Health Department. 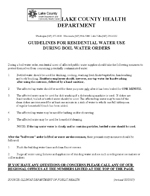 “Guidlelines for Residential Water Use During Boil Water Orders.